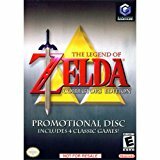 The Legend of Zelda: Collector.. Product weight is 0.31 lbs. The Legend of Zelda: Collector's Edition (Zelda / Zelda II: The ..
We were not expecting it to however this came in a case and had manuals. No scratches either. Great classic game. Cameron and Joy Fields .. Recently, I bought a copy of the LOZ: Collectors Edition(Zelda/Zelda 2:/ OOT & MM). I've played through andbeaten all the Zelda's except for MM. I can still remember buying the 1st Zelda game(Gold cart), and rushing hometo play it. I still have the game to this day and it still plays and saves games fine. My brother & I bought Zelda 2 atToy's r'Us as well, that was released about a year later. OOT is the greatest game ever created, for any console..